The last time I encountered the Mannheim Quartet on CPO they were playing Raff, and very persuasively too. 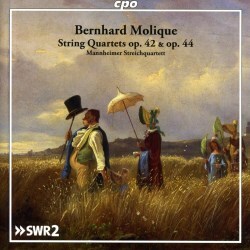 This time it's the turn of Bernhard Molique and lest one think this recondite material, Molique has been enjoying, as indeed has Raff and any number of similar composers, a degree of exposure on disc largely due to the urging of labels such as CPO and Sterling and, in the case of Molique's Violin Concertos, Accent. The two quartets were recorded back in 2009 so I assume they have been languishing in the SWR Stuttgart vaults awaiting the right time to be brought forth. I'm not sure there's ever a right, or indeed wrong, time to present Molique's chamber music but it has its own persistent appeal notwithstanding the short playing time of only 48 minutes and the fact that the other Molique discs on CPO have emerged with excruciating slowness. This is the last of the quartet set which has included all eight published works in the genre. Molique's lodestar in his Op.42 Quartet, which was published in 1851, was Mendelssohn and specifically his Op.44 No.2. There are decided thematic similarities in the opening movement that it would be difficult to avoid noticing. The second movement Menuetto is really a Scherzo in effect, with a lively, fast B section. Launched by pizzicato, the heart of the work is the Andante, a movement of elegant refinement, full of ample lyricism and warmth. This is Molique at his most captivatingly unbuttoned. In the finale, he shows another of his gifts, a Boccherini-like wit served with lashings of vigorous charm. The Op.44 Quartet is the shortest of the cycle and the last to be published (Leipzig, 1852). Its classical form is graced by a series of ascending and descending motifs that, allied to its compressed form, give it an air of confident elegance. The dance in the Intermezzo sounds distinctly Mendelssohnian and sprite-like, but the high point is surely the three-minute slow movement, which shows Molique's gift in spinning beautifully autumnal music that makes an instant appeal. This then moves directly into the free and easy finale. Once again, the Mannheim group doesn't disappoint. They're sensitive as to phrasing and tonally attractive added to which they chart the two quartets' architecture with great perception. Good booklet notes and an attractive studio recording mean that for anyone looking for Mendelssohnianly-inspired quartets, you need look no further.